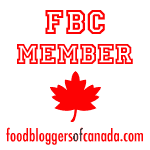 In my last Kitchen Tools post I talked about the bare bone essentials required for cooking. A good sharp knife, a cooking vessel and a heat source. 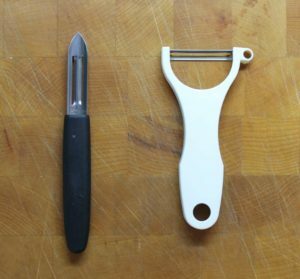 Since we covered the basic styles of knives used in most common cooking techniques last time, I’ll move on to other tools that can be just as important and make your life a lot easier. When selecting cooking tools to buy, always keep in mind that you want it to be easy to clean and maintain, and sometimes even repair. 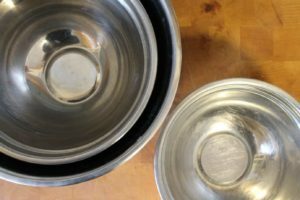 This is why for most things such as bowls etc., I will recommend using stainless steel. Stainless steel is functional, easy to clean and does what it’s supposed to do. You don’t have to worry about melting a hole into a bowl by accident if it’s made of steel. be invaluable when it comes to cooking, and are almost a necessity in baking. Where in cooking you can take on a more free-handed approach, where you can simply “eyeball” how much of something you need to use, in the baking world, you really need to be exact. Baking is a science. Different elements react together to create wonderful end products and while you do see a little of that in cooking, when you bake it is very important to follow the instructions and do things a certain way or the end product may not turn out the way you want it to. There are certain ratios to follow, bread is a great example of this. Without enough yeast, you won’t have enough rising power to properly rise your bread dough, and you will get a denser product. A lot of other factors can play into this as well, for example proofing times and such(we’ll get into that in another post) but without the right (and exact), combination of ingredients your baked goods just wont turn out well. 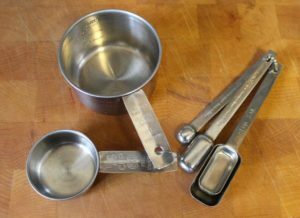 I suggest using stainless steel measuring cups and spoons, simply for the fact that they are easy to clean, can go in the dishwasher and wont warp as easily as plastic. They are simply more durable. Having a good scale on hand is also a good idea. I mostly use mine for baking, measuring flour by weight, things like that. 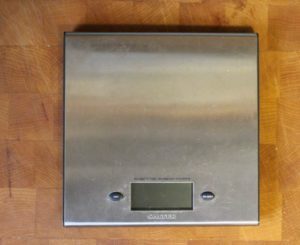 Being able to weigh ingredients can come in handy depending on the recipe. Roux for example (a butter and flour mixture used to thicken liquids) is made by using equal parts butter and flour BY WEIGHT. Believe it or not, if you measure out these ingredients by volume, you will end up with a very runny mixture. The weight of an ingredient is not always equal to it’s volume. ultimately up to you and the amount of storage space you have. 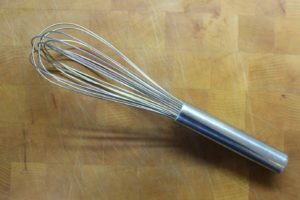 Along with a set of bowls, a decent wire whisk will come in handy when baking and making dressings or sauces from scratch. 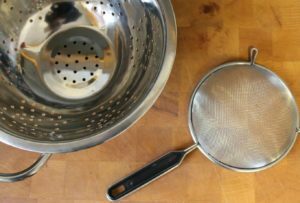 Another very useful tool to have in your kitchen at home, and which I use almost every single day in one way or another, is a colander and a sieve. If you can only pick one, go with a sieve! Regardless of if you are straining pasta, fishing out bones or vegetables from a soup or stock, or rinsing rice to get the starch out before cooking it, these are great to have around. 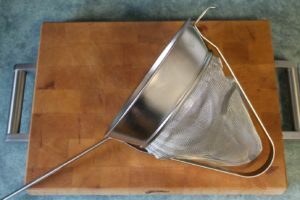 If you can only choose one, pick a sieve, since the holes are smaller and you can strain a larger variety of things with it. Colanders are good for large batches of things, but you can’t strain rice with it for example. If you want to strain soups and broths like the professionals do, invest in a chinois. These fine mesh strainers allow virtually no solids to pass through and are great for straining consomme’s, high quality stocks, and puree soups. Spatulas come in different shapes and materials. 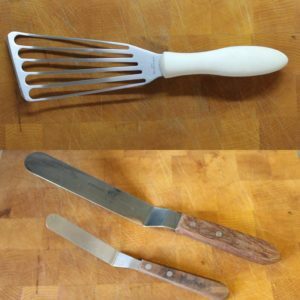 Heat resistant rubber spatulas are very versatile and can be used for baking, cooking, and various other tasks such as emptying containers to get every last scrap(such as chocolate!). Since they are specially made to be heat resistant you don’t need to worry about them melting in your pot. They are the most common multi-purpose spatula found in kitchens. Fish Spatulas like the one pictured on the top left, are ideal for flipping delicate items such as fish or other meats in a hot pan. The limited surface area created by the open spaces reduces the chance of the spatula sticking to the food. Offset Spatulas or palate knives as they are sometimes known, are pictured on the bottom left. They are great for use in different pastry applications, such as crumb coating a cake, spreading chocolate, lifting delicate items while plating. I have even use one, heated until glowing red in a flame, to brulee a creme brulee. Before propane torches where around, you would use a heated blade or cast iron mold laid in the fire to caramelize the sugar by passing it over the sugar in one quick swipe. (and safely). You are able to choose from digital or mechanical thermometers for regular use, (ie:. finding out what temperature a certain item has been cooked to). Make sure to pick a thermometer you are able to re-calibrate. Sugar thermometers are used in baking to bring sugar to very precise temperatures for different stages of caramelization. Sugar temperatures will affect the hardness of the sugar (thread,soft ball, firm ball, hard ball, soft crack,hard crack), once it cools. Unfortunately, if your sugar thermometer breaks, and the mercury (or whatever substance used) spills out, your sugar is garbage. (peeling vegetables duh! 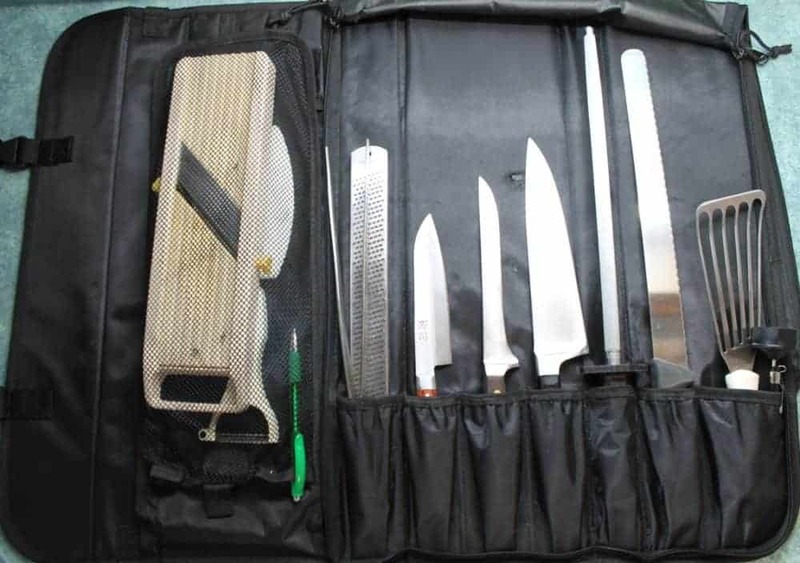 ), but do pick one that is comfortable in your hand, or simply use a paring knife. The fish tweezers are ideal for cleaning whole fish when you need to remove pin bones (more on that soon). If you don’t use the tweezers and try to do it by hand or with some other tool (other than tweezers), you will mangle and damage the flesh of the fish. 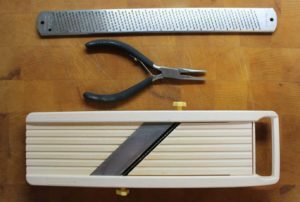 Regular home tweezers might work on smaller fish, but some pin bones such as in salmon can really be stuck in there good and regular tweezers wont be durable enough. Plus I’m sure your significant other won’t be pleased if they go to find the regular tweezers smelling all fishy! 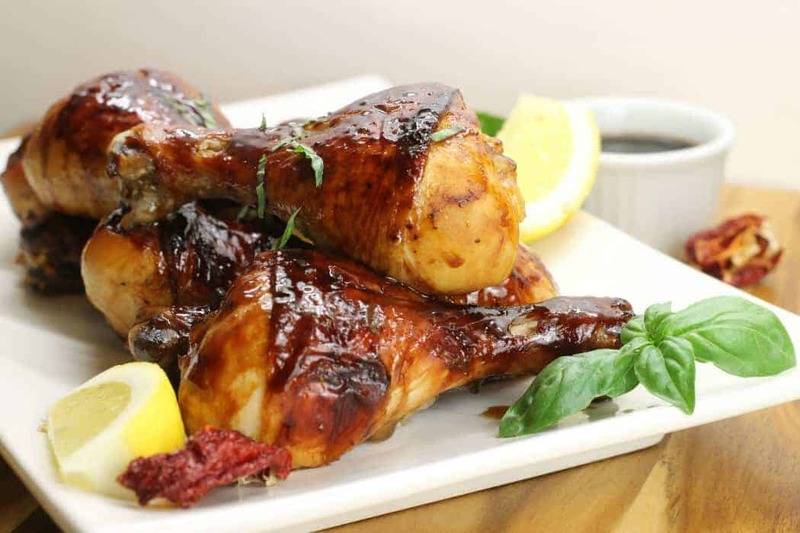 Tongs are great for a variety of things, like barbecuing, but are simply great to have on hand. I use mine every day. Ladles are also great, though I do not use mine at home nearly as often as I do at work. I simply don’t work in large enough quantities at home, though for some things like making hollondaise, having a ladle on hand can make your life easier. 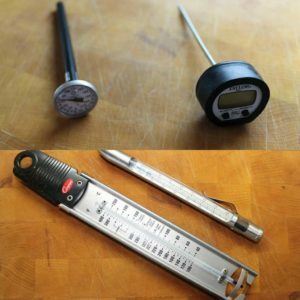 If you have a few of these tools in your kitchen at home already, that’s awesome! If not, now you know what to look for on your next trip to the store. These are the tools that I use the most often, and would say that besides a good set of knives, you can’t go wrong owning some of these. Keep an eye out for my next Kitchen Tools post where I will be covering more heavy duty equipment such as blenders and mixers!